DON'T RUIN YOUR CHANCE TO BUY A HOME WITH HOLIDAY SPENDING! If a new home purchase is in your future, or you're currently under contract to purchase a new home soon, please read this! 'Tis the season to spend, spend, spend. It's hard sometimes not to get overwhelmed with the Holiday gift giving spirit. Shoppers around the country say they are planning to spend an average of $882 for gifts this holiday season, up from $861 last year according to the 31st annual survey on holiday spending from the American Research Group, Inc. Of that $882, a good portion of it usually goes on a credit card. Typically, this is not a big deal, but if you're currently under contract to purchase a home or have the intent to buy a home in the near future, be aware of the debt you are adding up. If you are using a bank to help finance your home purchase, realize the amount of credit card debt you rack up during the Holiday's will affect your debt to income ratios as a lender reviews your ability to repay the loan back. A debt to income ratio is where a lender is reviewing your current unpaid balances of credit cards, student loans, merchant credit cards and car payments. All the outstanding debt that you owe is added up and then evaluated against your current income. The ratio is calculated based on the loan you are approved for and the ratio itself can fluctuate depending on the loan program and bank you use, the important piece is this… if you currently are under contract to purchase a new home, changes in the debt that you owe could tip your possibility of getting a final approval in your new home purchase. Please remember your credit is constantly being evaluated during the home buying process and even though you were able to obtain a credit approval letter from your bank (preapproval letter). You MUST maintain those ratios past the actual closing day. A review of your credit rating, debt, and an income verification are usually done 1 day prior to closing or on the day of closing. Any changes even small could affect your ability to buy the home you waited so long to purchase. Don't Ruin Your Chance to Buy a Home with Holiday Spending!Yes, there's lots of great deals out there especially if you apply for a merchant credit card while making your purchases. In everyday purchases, it's great to save an extra 10-20% when you open up a merchant credit card, but if you're buying a home soon or in the middle of your home purchase, the extra credit pull on your credit could bring your score below the acceptable number for your purchase. Now, if you're credit rating is high 780+ it may not disqualify you from the entire purchase of the home, but it may require you to explain why the new credit inquiry can be seen on your credit report. A required explanation of debt could hold up your closing and could potentially cost you either in a fee for delaying the closing, or complete cancelation of the purchase. Although, tempting the rule of thumb when purchasing a home is, 'just don't touch your credit,' pay your bills as agreed, don't take out any new debt, don't close current or revolving debt (even if you paid the balance off! ), don't add to the current debt you have. There are exceptions to these rules, but regardless you should ALWAYS consult with your lender before changing anything with your credit. If you're planning to purchase a home in the next few months to a year, follow the same rules. Pay your balances on time, if you can pay a little extra on a balance here and there, do so, the credit bureau will give you a better number if they see you are paying more than the minimum and keeping your credit card balances at 1/3 of the limit. As mentioned above, if you have cards with zero balances (especially if they have a long credit history) don't close them! Lenders like to see at least three positive lines of revolving debt even if it's a card with a zero balance. Regardless if you're in the middle of a new home purchase or planning to…. the debt you are accumulating is debt that needs to be paid on a monthly basis. Adding a mortgage payment, your taxes, insurance, and a possible HOA (homeowner's Association Fee) if applicable, could put you over your monthly budget. Keeping expenses low especially for the first year of new home ownership will help you ease into the new expenses. The last thing as a Professional Realtor I want to see is a new homeowner that's over their head with new home expenses. “A lot of people get by, paying the minimums on their credit cards,” said Durant Abernethy, president of the National Foundation for Credit Counseling. “Add on the holiday bills and all of a sudden, those minimums are more than they can afford.” “People in trouble generally don't have a good idea of how much they spend,” said Abernethy, whose group is the umbrella for the nonprofit Consumer Credit Counseling Service agencies around the country. He emphasizes the importance of budgeting and planning ahead, saying: “If you need to use a credit card to reach a goal, you should be able to pay it off in no more than 90 days — and, preferably, in 30 to 60 days. ” If you're still paying off Christmas debt from last year, it's time to take a hard look at how you're using Don't Ruin Your Chance to Buy a Home with Holiday Spending!your credit cards. Consumer counseling agencies see a 25 percent increase in the number of people seeking help in January and February, and most of that traffic is propelled to their doors by holiday bills that haunt consumers like the ghost of Christmas past. “Our parents viewed debt as a shame and accumulating a nest egg as the right thing to do,” Manning said. “The young see that as 'old school' and have been convinced that going into debt is fine.” The result, he said, is that while 40 percent of credit card users pay their bills in full each month, the remaining 60 percent roll them over — and over and over. He calculates the average balance of these “revolvers” at more than $11,500. “The debt industry — and it is an industry — has persuaded people that their 'wants' are 'needs' and that if you really care for someone, you'll spend more money on them,” Manning said. “They tell you it's so easy, just use plastic. But they don't tell you how it will hurt, in mounting debt and higher interest rates and higher fees.” You can figure out just how much your Christmas debt is costing you to carry by using calculators on the Internet. Plug in $1,000 at 17 percent (the prevailing credit card rate) in the calculator at www.bankrate.com, and you'll find that your interest totals $94 over one year and $187 over two. Nancy Dunnan, the author of “How to Invest $50 to $5,000,” recommends that the way to begin getting a handle on credit card debt is to make a list of all your unpaid balances along with the corresponding interest rate, “then start paying down the card with the highest rate first.” Doing so will save you money on the accumulated interest when you're paying off your balances faster than expected. Also removing your debt will help with your debt to income ratios, your ability to handle the new monthly fees and help your credit score in order to get you into that new home! “And use this as a heads-up for next season,” Dunnan said. “Figure out what you spent this year and try to put aside some money each month so you'll accumulate that amount by next Christmas.” She adds: “If it's more than you can afford to set aside, then maybe you need to cut back on Christmas spending next year. 1. Buy a few gifts each week. Instead of waiting until the last moment to do your Christmas shopping, space out your purchases over the weeks leading up to the big day. Then you won’t end up with a long list of things to purchase in a short amount of time, forcing you into quick, irrational buying. 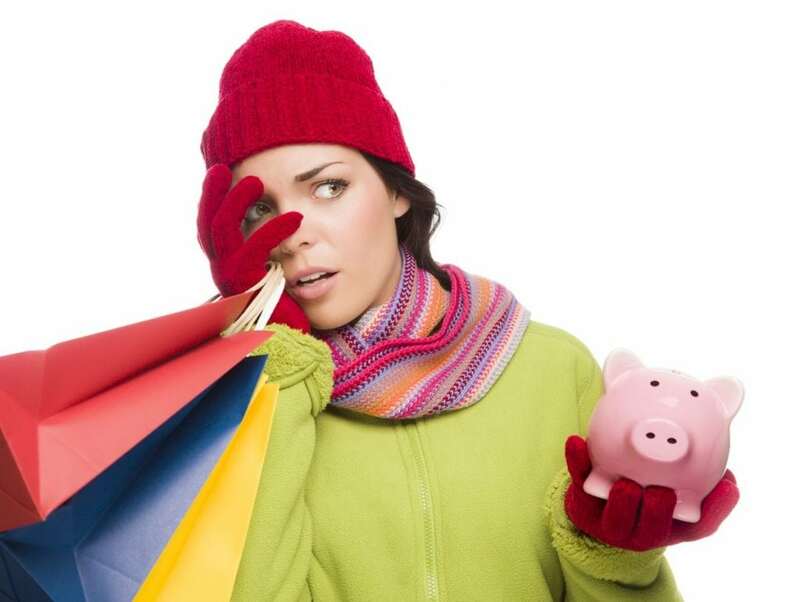 If you start early, you can take your time, shop during sales and pay off purchases before they start to accumulate. Moreover, you may be able to spread out your credit card bills from your holiday shopping over more than one month, making the total easier to pay off. 2. Treat credit cards like cash. Don’t spend more on your credit cards than you can afford to pay back by the end of one payment cycle. Pay your balance before any interest has time to accrue, so you still get the benefit of being able to buy something before you’ll have the money to cover it without also having to pay added interest. If you don't have to use a credit card DON'T! 3. Set a spending limit. Cap your gift-giving budget to an amount that’s affordable for you. Most people plan to set some sort of shopping budget, as 68% of those surveyed do, but not everyone factors in the other irregular expenses that creep up during the holidays and that last well into the new year. Give yourself some wiggle room by looking at other areas in your overall budget where you can cut back. Maybe you can dine out less or reduce how much you spend on leisure for the next couple of months. 4. Be realistic about what you can give. Sometimes you just have to be honest with yourself about what’s doable and what’s not. You may want to give lots of gifts this year, but there are other ways to give if you don’t really have the money to buy them all. Come up with thoughtful gift ideas that keep you from spending too much but still let others know you care. An expensive gift isn’t the only way to show your kindness. 5. Take advantage of cash back rewards programs. If you have to use a credit card to do your Christmas shopping, use one that has a rewards program or an extra % discount (and one that is already open!). That way you’ll earn points for your spending that could be used toward a gift for yourself in 2016 – a reward for acting within your limits during the holidays. Overall, what your debt and watch your spending. Eliminating your possibility of owning a home soon will not be a very merry Holiday for anyone. Consult your Realtor and your lender (loan officer) with any questions before making any credit changes.